← Project Kids Card App – Free! One of the preschool students at school has an iPad Mini dedicated for his communication. Using a dedicated device differentiates it as a specific tool for communicating as opposed to devices that may be used for multiple activities (e.g. a educational activity, self-regulation tool, timer, a reward or leisure activity). Although there are typically many tools used to support communication (visual schedules, signing, visual supports, speech generating device, etc. ) a dedicated device such as the iPad with an AAC app provides more flexibility and options and supports for communication for a student with complex communication needs (images, text, speech, levels of displays, etc.). 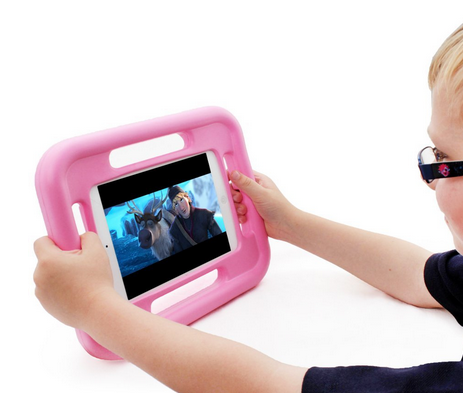 For youngsters with small hands and developing motor skills, finding a safe and manageable iPad Mini case was important. 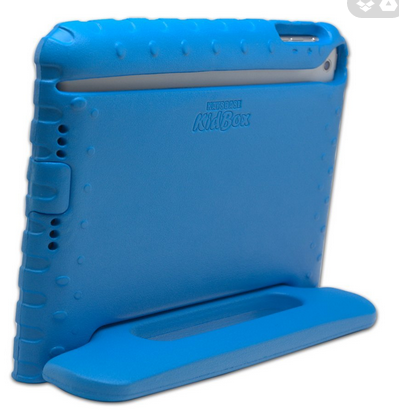 One of the many cases out there that seemed to fit the bill was the Kay’s Case KidBox Mini for Apple iPad Mini (Bluey) (also comes in an array of colors, Orange, Limey, Mr. Black and Pinky) to protect, position and allow the student to carry his communication tool around. At $18.95 (at Amazon) compared to OtterBoxes or Griffin cases, I thought Bluey was a bargain. This case was easy to carry and also provided a stand for easy viewing by the student. The protective case was adequate for the students’ use with supervision by staff when used for communication. Another case worth considering is the Snug Case for iPad mini, offering handles around the protective case. It is offered in blue and pink with a slightly higher cost (24.95) but seemingly offers a Lifetime Guarantee. It does not offer a stand but does seem well protected and very easy for kids grab, hold and cart around with the handles on all sides. You might not be the Speech and Language Pathologist who decides on devices for AAC, but you might be the one who helps determine the case or recommends cases to parents of small children. Here are just a few cases that might suit the needs of your clients with little hands! 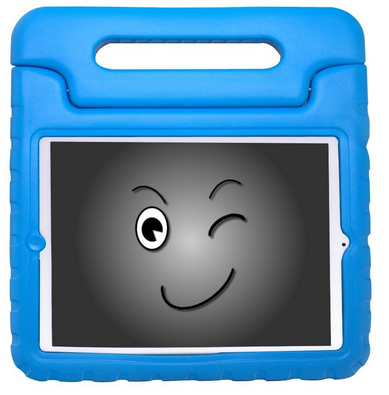 Are you using or recommending any particular cases for your iPad Minis? Share your experiences and recommendations! Interested in iPad and iPad Mini accessories, equipment and apps for your school based practice? Join OT’s with Apps @ School Workshop August 11 & 12. For more information contact me at otswithapps@gmail.com or here for OT’s with Apps at School workshop description and registration information. More for your teaching, parent or OT mTool Kit! This entry was posted in Accessories, Augmentative Communication, Early Childhood, Elementary School, iPad, iPad Management. Bookmark the permalink. Where do I find the pink case with handles on all sides that you’ve listed here? The link does not work and it doesn’t have a brand name. I want to buy one for my mom who has bad hands. Thank you! Hope that helps. Thank you for visiting!